In today’s astrobite, we cover the discovery of the orbit of an ultracompact X-ray binary, IGR J17062–6143 (depicted in Figure 1), which harbors an accreting MSP. Using the newly commissioned Neutron Star Interior Composition Explorer (NICER) X-ray instrument on board the International Space Station, Strohmayer et al. showed that the system consists of a very low mass white dwarf in a record-setting 38-minute orbit with a pulsar that rotates at about 9,800 revolutions per minute. Figure 1: Artist’s impression of the two stars comprising IGR J17062–6143, which circle each other once every 38 minutes (the fastest orbit for an accreting MSP in a binary system). Credit: NASA. Figure 2: Average power spectrum from NICER observations of IGR J17062–6143 obtained in 2017 August. The presence of sidebands indicates that the X-ray photons are affected by the orbital motion of the pulsar. Credit: Figure 3 from the paper. As the MSP whirls around its companion, the X-ray pulses are Doppler shifted by the orbital motion of the pulsar (see Figure 3). In other words, some pulses will arrive sooner when the MSP is moving closer, and others will arrive later when the pulsar is moving further away. This important property allowed the authors to show that IGR J17062–6143 has a nearly circular orbit, and the MSP and white dwarf companion are separated by only roughly 186,000 miles (300,000 km) – less than the distance between the Earth and the Moon! 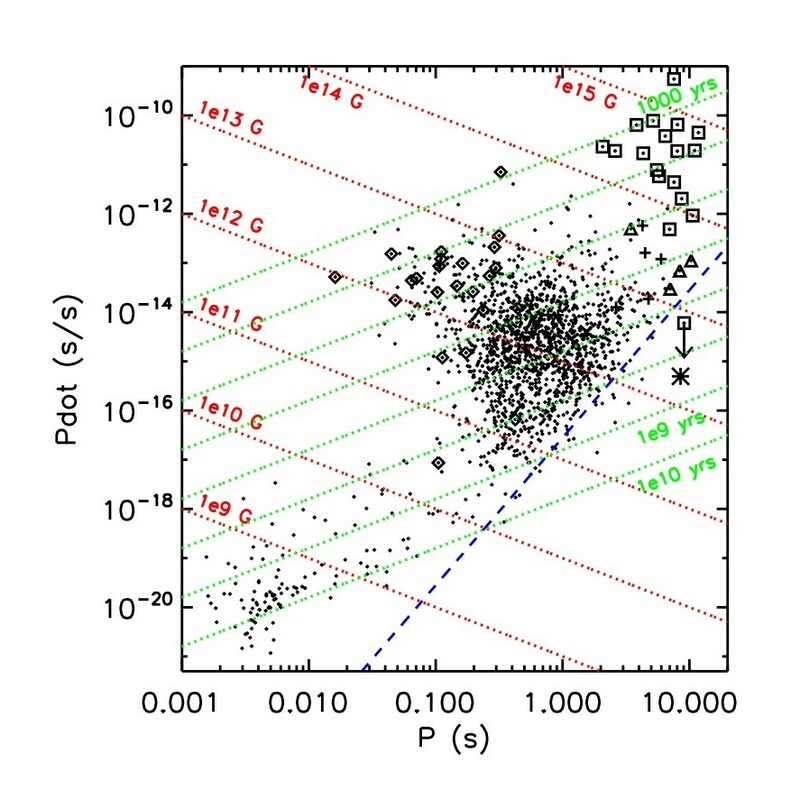 The authors also provide constraints on the viewing angle of the binary and the mass of the white dwarf, which they find is ~57-65 times less massive than the Sun assuming that the donor star is hydrogen-deficient. However, the precise chemical composition of the white dwarf is still under debate. This is interesting because it is thought that accretion of hydrogen-deficient material on short timescales is a feature unique to ultracompact binaries. Ultracompact binaries, such as IGR J17062–6143, therefore serve as laboratories for studying the physics of accretion in a substantially different environment. Further investigation is also needed to understand the nature of the X-ray outbursts observed from this object, which are believed to be powered by thermonuclear reactions on the surface of the neutron star. Figure 3: Best-fit orbital solution (blue) and pulse phase residuals (black) as a function of mean pulsar longitude, derived from NICER observations of IGR J17062–6143. The orbit-predicted phase delay is added to the residuals to show the orbital variability. Credit: Figure 6 from the paper. Ultracompact X-ray binaries, like IGR J17062–6143, are interesting for a variety of reasons. Since the donor star in these systems are sometimes helium rich, when one sees signatures of carbon and/or oxygen in their stellar spectra, we can learn about how the core of the star has evolved through helium burning. This is one of the topics Strohmayer et al. plan to investigate in their next work. Future NICER observations of IGR J17062–6143 will also allow astronomers to watch for enormous helium-powered thermonuclear explosions on the surface of the neutron star. Additionally, observations of X-ray pulsations from these systems will help astronomers probe the fundamental physics associated with neutron stars and their surrounding environments. With such an exciting discovery from the first set of NICER data, we can expect that there will be more remarkable things ahead! I am a Ph.D. candidate in Physics at Caltech. My research focuses on searching for new pulsars near the center of the Galaxy using JPL's Deep Space Network radio dishes in the southern hemisphere. I am also interested in studies of magnetars, FRBs, gravitational-wave searches, and high-energy observations of compact objects. When I'm not hunting for pulsars, I can usually be found hanging out with my dogs or trying the latest vegetarian cuisine Los Angeles has to offer! A Pulsar Alone Testing Einstein’s Equivalence Principle by Timing a Pulsar in a Stellar Triple System Observational Signatures of Accretion Induced Collapse of White Dwarfs What does a neutron star actually look like?